Mrs. Baalrud grew up in Wisconsin and, after graduating from The University of Wisconsin-Madison, she moved to Chicago to begin her teaching career. 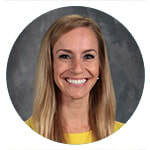 She teaches first grade and looks forward to sharing in the excitement and curiosity that first graders come to school with each and every day. She also loves watching her students grow and develop both as learners in the classroom and as individuals who are part of a strong classroom community. In her free time, Mrs. Baalrud loves to travel. She spent part of her time as a student teacher in Namibia and ever since then, can always be found in the midst of planning another trip! She also enjoys running, yoga, cooking, reading and finding the best new restaurant spots to try around Chicago.